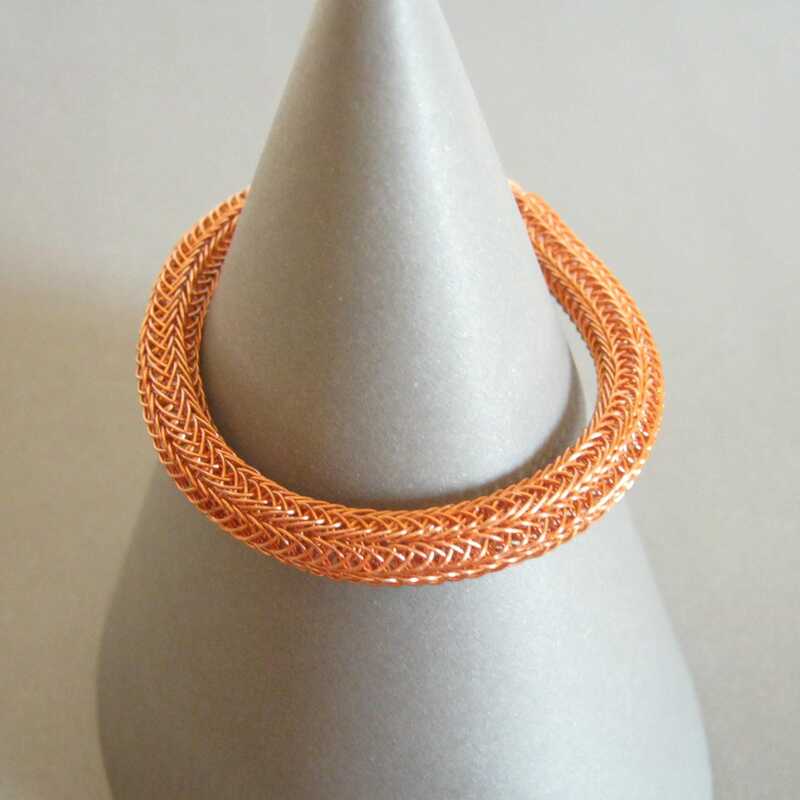 A thick woven copper bracelet crafted using the Viking knitting technique, finished with coiled wire tips and handmade clasp. Double knit using 26 gauge bare copper wire. - As shown: 7" (18 cm) long. Need it longer? I can extend it with chain or create one to your custom length. - Bare copper develops a natural patina over time. To extend time before polishing, do not leave in your bathroom (or other damp places) and put on AFTER applying make-up, lotions, and perfumes. - Polish with your preferred copper jewelry cleaner or use a mix of lemon juice diluted with water and table salt. Swish or scrub until shiny and clean in soapy water. Let dry before storing. - Bare copper and sterling silver orders include a small polishing cloth. Convo to add a full size to your order for an additional $2.50. Copper is traditionally gifted on the 7th wedding anniversary. ALSO available in Sterling Silver - Allow 2 weeks (plus shipping) for sterling silver. Viking knit chain dates back to the 8th century AD. The technique involves looping a continuous length of fine gauge wire (I prefer 26 gauge) around a dowel and drawing the chain through progressively smaller holes until it reaches the desired density, flexibility, and thickness. Over time, the copper will darken naturally into a lovely patina or use your preferred jewelry cleaner or provided polishing cloth to keep it shiny bright.